2 Place the twigs, resin, pebbles, and berries in piles along the bank of the river. Place the point tokens and occupied tokens beside the board. 3 Shuffle the Forest cards and place them on the forest clearings. Use 3 cards for two players, or 4 cards for three or four players. Put the remaining cards back in the box. 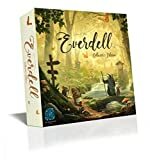 4 Place the 4 basic Event tiles along the river, then shuffle the special Event cards and place 4 special Events on the lower branches of the Ever Tree. Put the remaining special Events back in the box. 5 Shuffle the main deck and randomly place 8 cards faceup in the Meadow. Place the deck inside the Ever Tree. 6 Each player chooses a color and starts with 2 workers of that color. The first player will draw 5 cards from the deck, the second player 6 cards, the third player 7 cards, and the fourth player 8 cards. 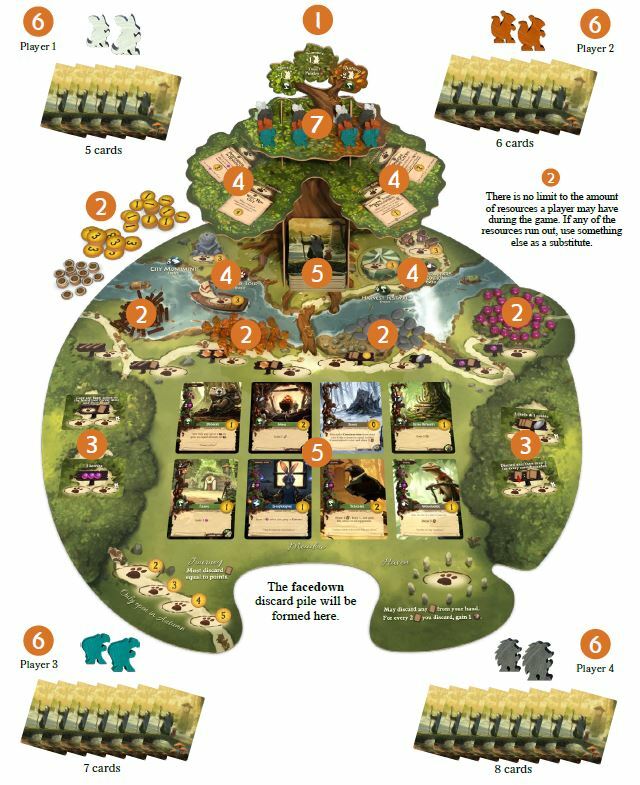 7 Each player places their 4 other workers on the upper branches of the Ever Tree: 1 worker on spring, 1 on summer, and 2 on autumn. The most humble player goes first. Play proceeds clockwise. You will take turns performing one of the following actions. These actions may be performed in any order, but only one action may be taken per turn. Your workers are necessary for the expansion and success of your city. 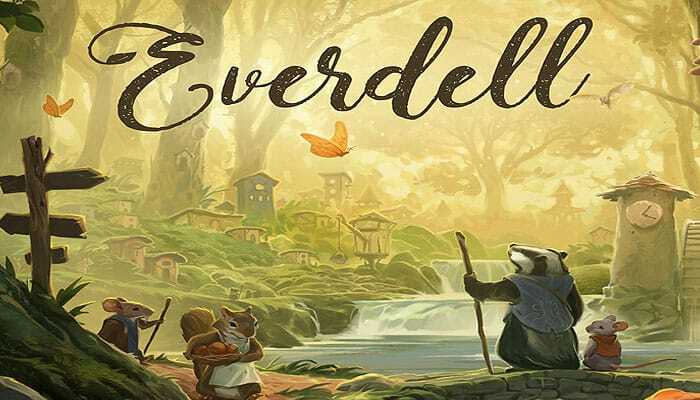 You will be deploying them to various locations in Everdell in order to gather resources, draw more cards, host events, or perhaps to embark on a journey. There are two types of locations: exclusive and shared (portrayed with an open encircling ring). Only 1 worker may visit an exclusive location. 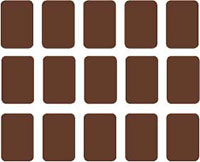 Multiple workers, even of the same color, may visit a shared location. To visit a location, place one of your workers on any available symbol and immediately take the listed resources or perform the action. That worker is then considered deployed to that location until you bring them back with the Prepare for Season action. 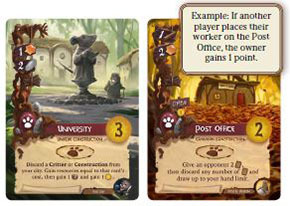 Example: Placing a worker on the second basic action space gains the player two twigs, and a card drawn from the deck. The placement locations are only used in a four-player game. However, you may not place 2 of your own workers on a single Forest location. You may place a worker on any Destination card in your city, or on a Destination card in another city that symbol, in which case the owner of the Destination gains 1 point token from the supply. You may also place 1 of your workers on any remaining basic Event or special Event to achieve it. To achieve the Event, you must meet all the listed requirements on the Event, and must pay any resources at the time you place your worker there. Only one player may achieve a specific Event. You have to be able to achieve the Event to place a worker on the Event. Achieved Events should be placed beside your city for scoring at the end of the game. The Haven location is a shared space. There is no limit to the amount of workers that may be placed on it, even of the same color. By going here, you may discard any number of cards from your hand, and gain 1 of any resource for every 2 cards you discard. In autumn only, you may send a worker on a journey. 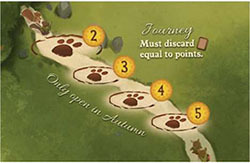 You must discard cards equal to the listed points of the Journey location you choose. The 5-point, 4-point, and 3-point locations are exclusive, and the 2-point location is shared. The deployed worker is worth the listed points at the end of the game. You may play one card. To play a card, you must pay the listed requirements into the general supply. Cards may be played from either the Meadow cards or from your hand. You will be playing these cards in front of you to form your city. 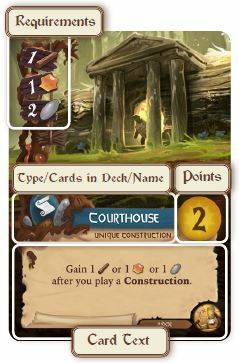 There are two types of cards in the game: Critters and Constructions. You may have multiple copies of any Common card in your city, but you may only have one specific copy of any Unique card. 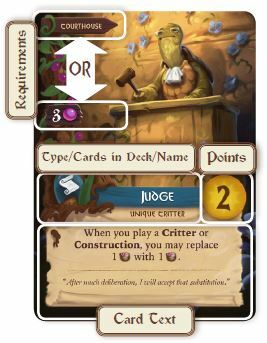 You may pay the required cost in berries to play the Critter card, or if the Construction listed in the top left of the Critter card is already in your city, you may play the Critter card without paying the cost in berries. Important: When playing a Critter for free by using the related Construction, place an "occupied" token on the Construction. You may only do this once per Construction. Your city has a maximum of 15 spaces to play cards into. Each card takes up one space. Recommended layout is 3 rows with 5 cards in each. Event cards do not count against this 15 card limit. Activates once immediately when played. It never activates again. Activates once immediately when played, and once during the Prepare for Season actions in spring and autumn. Activates when a worker is placed on it. Cards with the symbol may be visited by opponents. Grants you bonuses after playing certain card types, and offers different ways to play cards for a discount. Worth the base points and the listed bonus points at the end of the game. Always draw cards from the deck, unless specifically told to draw them from the Meadow cards. There is a strict hand limit of eight cards. You cannot ever have more than eight cards in your hand. If you get to draw cards, you can only draw up to eight, no more. If you are required to give cards to an opponent and all opponents' hands are full, discard the cards instead. If a Meadow card is played, immediately replace it with a new card from the draw pile. If an ability allows players to draw cards from the Meadow cards, draw all cards first then replenish. If the deck ever runs out, shuffle the discard pile to form a new deck. Gain: take listed resource or point tokens from the general supply. Pay: place listed resources from your supply into the general supply. Pay: place listed resources from your supply into the general supply. Thematically the game begins in late winter and ends as the next winter approaches. Autumn is the last Prepare for Season action you may perform in the game. The Prepare for Season action may only be performed after you have placed all of your current worker population. When you perform the Prepare for Season action, you alone bring back all of your deployed workers. In spring, you gain 1 new worker and activate all green Production cards in your city. In summer, you gain 1 new worker. There is no Production in summer, but green cards still activate immediately if played during summer. Also, you may draw up to 2 Meadow cards when you prepare for summer. In autumn, you gain 2 workers and activate all green Production cards in your city. When preparing for the next season, new workers from the Ever Tree join your growing city. Gain your matching worker and activate the next season's listed bonus. When you cannot perform any more actions (or do not wish to), you have finished the game and must pass. 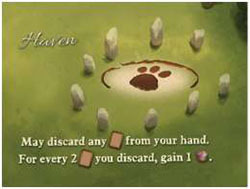 If a player has passed, they cannot be given any cards or resources. If cards or resources have to be given to a player and all other players have passed, discard instead. Any unfinished players continue playing until all players have passed. Then add up all points to determine the winner. You may find it easiest to add up the base value of each card, then come back and add up point tokens, purple Prosperity card bonuses, Journey points, and Events. If there is a tie, the player who achieved the most Events wins. If there is still a tie, the player with the most leftover resources is the winner.